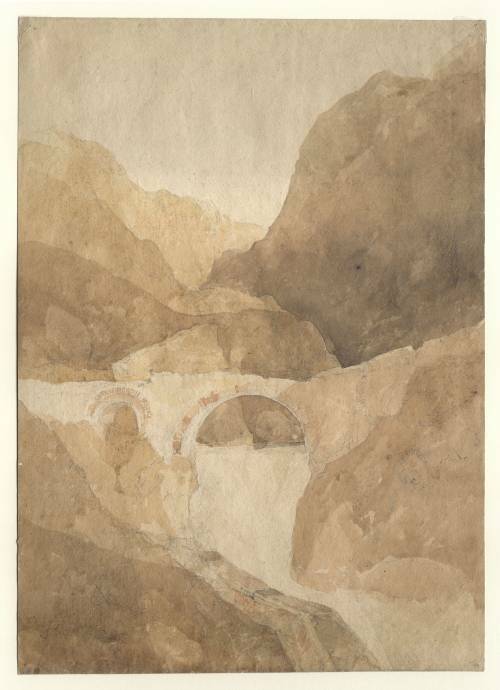 The British artist John Sell Cotman (1782–1842) was one of the most original and important watercolour painters of the nineteenth century. He is loved today for his remarkable Yorkshire 'Greta series' of watercolours and recognised for his sensitivity to the growing brutality he saw in society of his own time. 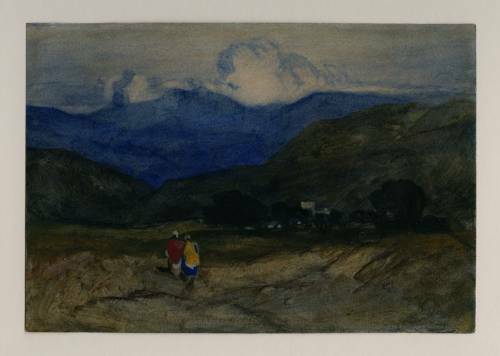 For much of the twentieth century Cotman was the most widely admired English watercolourist celebrated as a proto-modernist with a public profile surpassing even that of Turner in popularity. 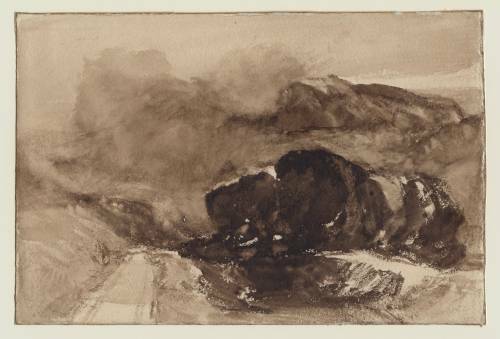 Shelter from the Storm presents many of Cotman’s finest watercolours from the Leeds collection and hundreds of his sketchbook drawings that have never been exhibited before. 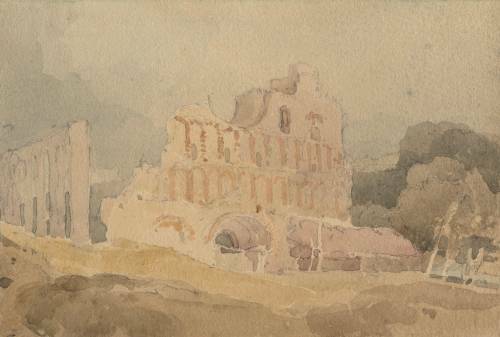 Most of these works were collected in the 1920s and 1930s when Cotman’s reputation stood at its highest. His sense of the pastoral, humanistic sympathy, and his artistically sensitive and subtle vision stood quietly against the storms of the interwar years of boom, great depression, and a drift towards fascism and war. Today Cotman’s values may be thought more vital than ever. and ultra-high resolution images accessed. Throughout his career Cotman worked in small, hard-backed sketch books, recording everything that caught his eye. 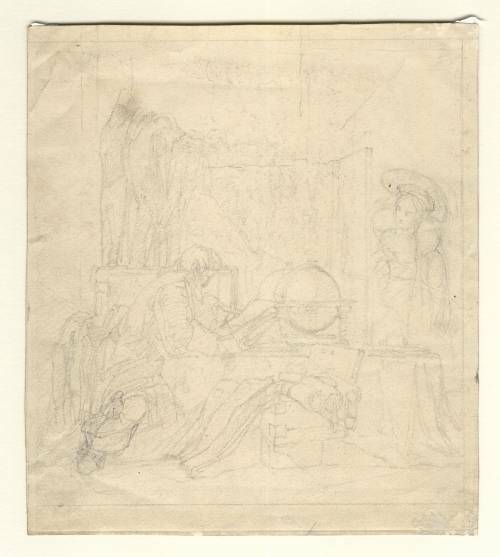 After completing these drawings, Cotman would often cut them out and mount them on large sheets of paper. Over one hundred of these sheets were sold after Cotman’s death, many of them to the prominent architect Sydney Decimus Kitson (1871–1937) who left his entire collection of sketches by Cotman to Leeds Art Gallery in 1937. 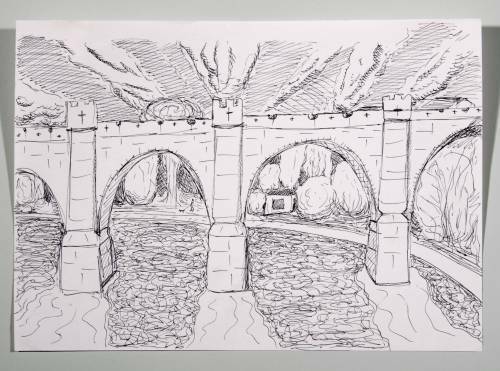 Leeds Art Gallery’s collection now contains over eight hundred of these sketches, making it the largest single collection of Cotman’s sketchbook drawings. 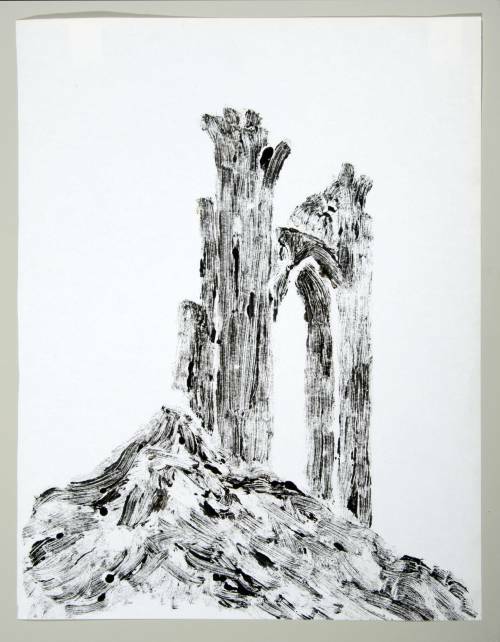 Very few of these drawings have been exhibited before. Over the last three years, the extensive collection has been catalogued and conserved. 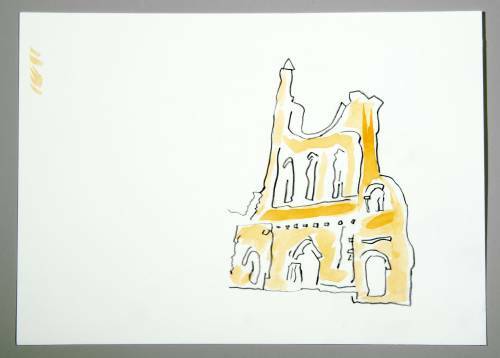 Together, these remarkable drawings – some no larger than a postage stamp – demonstrate Cotman’s considerable skills as a draughtsman. Cotman encountered this scene during tours of North Wales in 1800 and 1802 while still a teenager, and painted it a short time later, when he was still only 24. 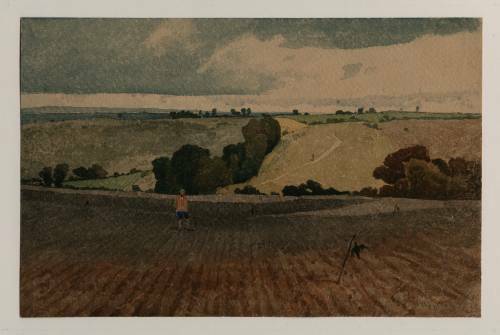 This watercolour is Leeds Arts Gallery’s first Cotman acquisition: it was bought by the gallery in 1922. This scene is probably located in the Wolds a few miles north of York, near Brandsby Hall where Cotman stayed with his friends the Cholmeley family. 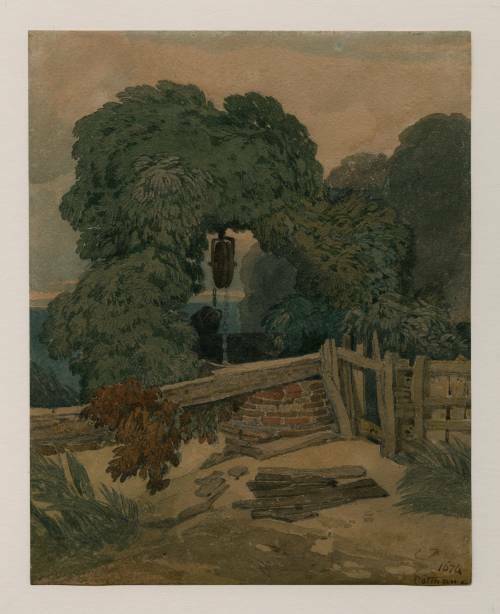 This is one of the best-known examples of Cotman’s ‘poetry of the pastoral’. None of his works have been exhibited more widely, or more often. In 1805 Cotman stayed at Rokeby Hall, near Barnard Castle, County Durham, and spent several weeks painting and sketching directly from nature. Kitson bought this work at auction at the height of the Great Depression in 1932. It was sold to Kitson by the Worsley family of Hovingham Hall, North Yorkshire. 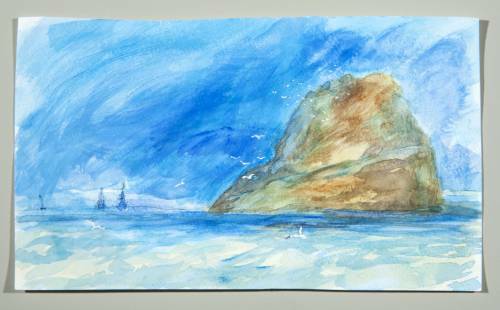 This is one of Cotman’s most important watercolours. 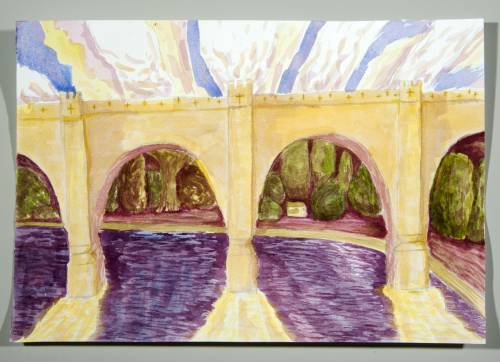 It takes the same landscape as Barnard Castle from Towler Hill, exhibited nearby, but transforms it into an imaginary Arcadian idyll. Pastoral subjects were fashionable and had great appeal at the time of Industrial Revolution, and again found favour in the years following the First World War. 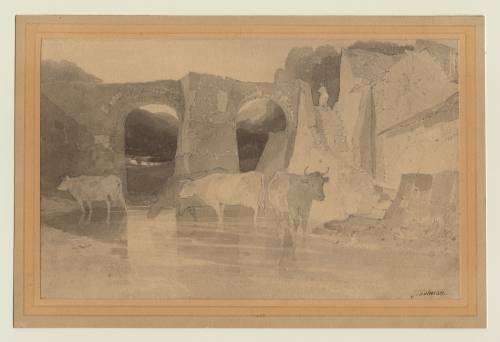 The subject of this drawing – which has also been known as Bridge and Cows – was recently identified as Bridgnorth, Shropshire, a place that Cotman visited during his tours of Wales in 1800 and 1802. In 1806, at the age of 24, Cotman gave up trying to make a living in London, and returned to his native Norwich where he continued to develop his austere and uncompromising style. While developing the drawing school in Norwich, Cotman also began to paint regularly in oils. This subject records a subject on the river Yare somewhere downstream of Norwich. Cotman’s oil paintings have been little studied, and are unusual for their times, especially if compared to his contemporary, JMW Turner. Cotman takes reticence and quietude into altogether new territory. In the mid-1820s Cotman returned to painting after more than ten years of working on architectural etching projects. 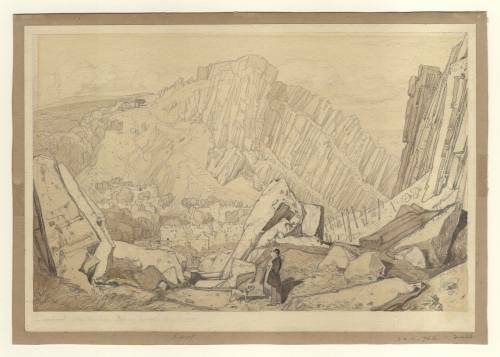 At this point in his career, Cotman drew on many of the sketches he had made in Wales more than 20 years previously but more than ever before reduced topography to poetics of colour, application, composition and design. Cotman had a close relationship with his children. This affectionate sketch probably records his fourth child, Francis Walter, who was born in 1816. At that time the Cotman family lived in a small house at Southtown, Yarmouth. This drawing might record a day out at the beach. 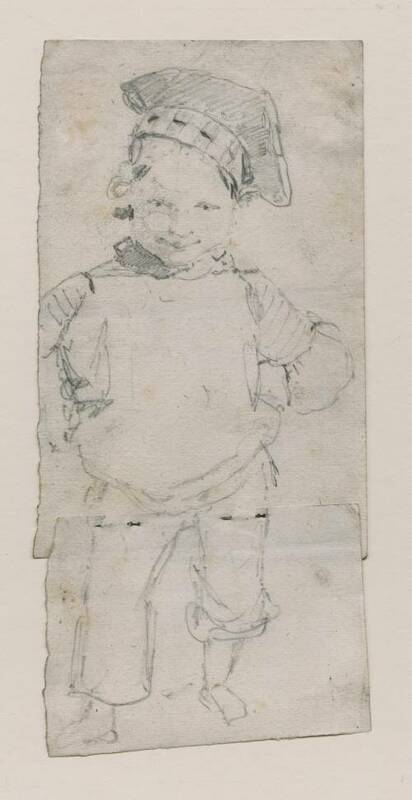 Cotman made many sketches and drawings featuring children. The similarity of this young girl’s profile to depictions of Mrs John Sell Cotman suggests a family relationship. 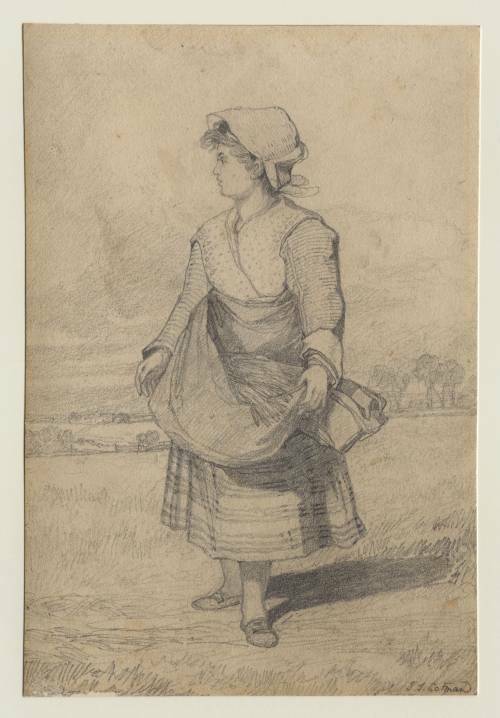 The model might be Cotman’s only daughter, Ann, who was born in 1812, and appears here to be about 12 years of age. After two weeks staying at Rokeby Hall, Cotman stayed on at the nearby Morritt Arms at Greta Bridge. In his letters, he describes bathing every day in the river a short way above Greta Bridge. Today, the site is unchanged, and is still a good spot for swimming. 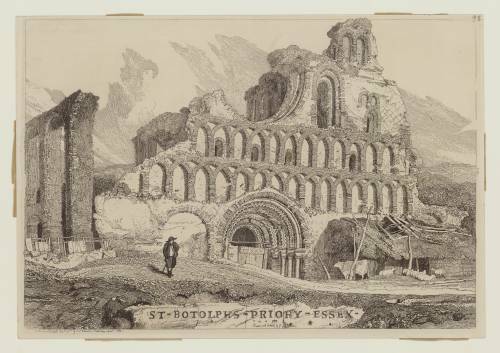 From 1808 Cotman sought refuge and respite amongst the quiet churches and abbeys of Norfolk. Walsingham Priory is located in north Norfolk, not far from the seaside town of Wells-next-the-Sea. Cotman was particularly attracted to humble dwellings such as the lean-to shack nestled amongst the ruins in this scene. The shack appears to have been a carpenter’s bothy, as records show that there was building work taking place in nearby Walsingham Hall. 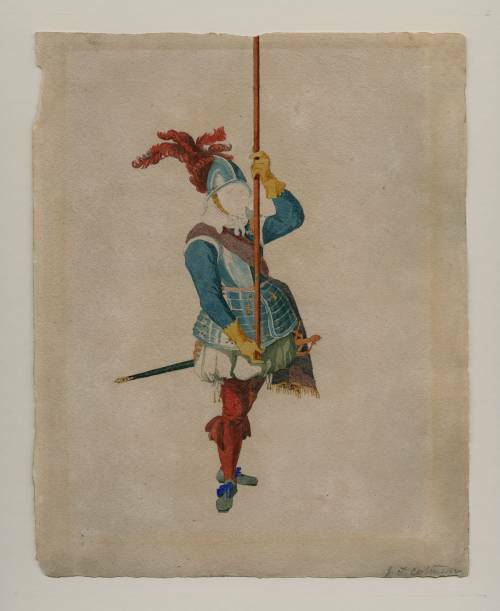 These four watercolour studies show soldiers in full military uniform. While their costumes seem to suggest that they are Spanish they are in fact Dutch and are based on an important set of etchings by the artist Jacob de Gheyn (c. 1565–1629). The Dutch weapons drill was considered at the time to be the most disciplined in Europe, and remains the foundation of military exercise drills today. 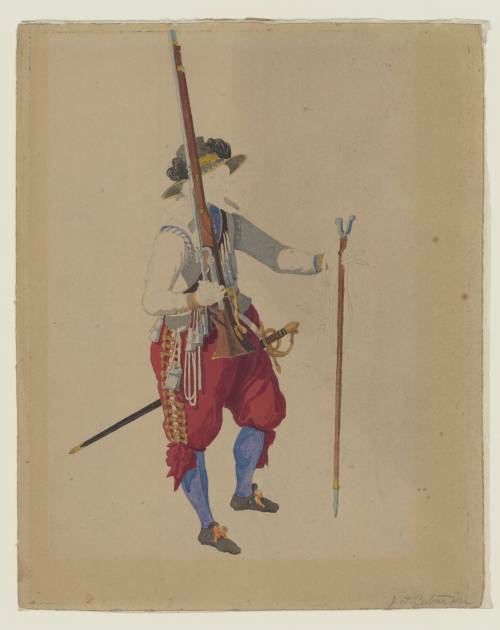 Cotman had a large collection of historical etchings, books, armour and weapons. Most of this was sold to pay off debts in 1834. 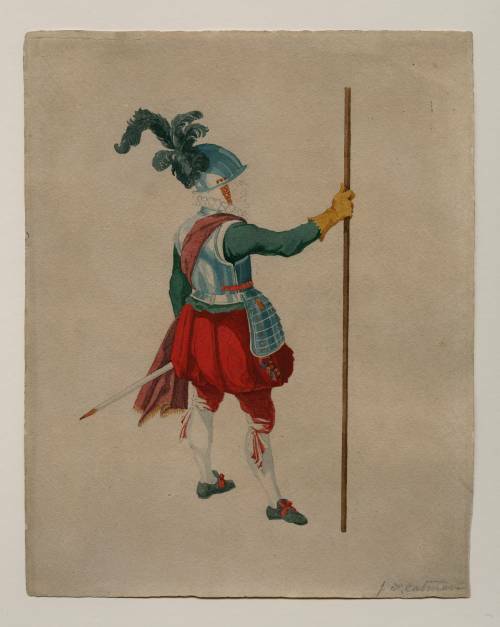 The sale included two lots of prints whose subject was Swiss, German and French costumes, military costumes and antique dresses. The plates in these collections of prints might have contained the originals of Cotman’s studies. 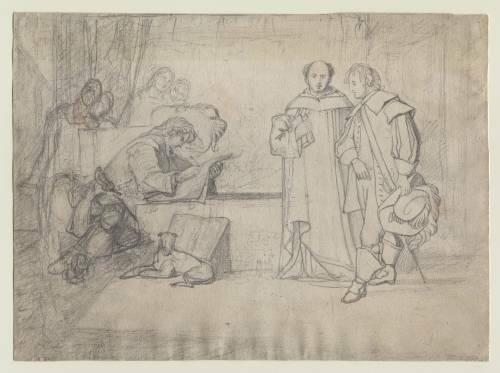 This is one of several compositions that Cotman made in the 1830s showing an artist receiving grand visitors in his studio, in which the artist is depicted as just as distinguished as his guests. 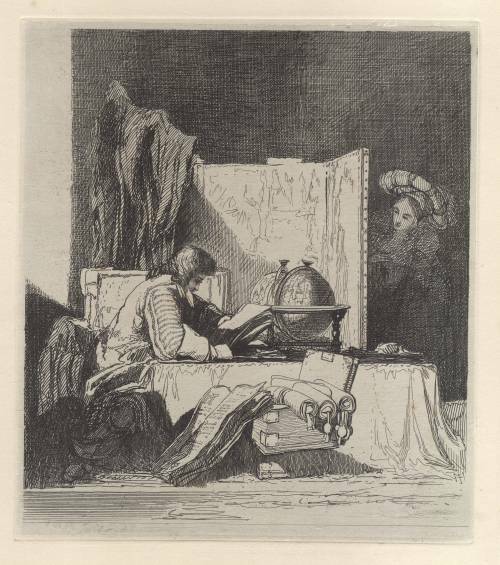 This is another of Cotman’s 1833 series of etchings, made in the style of the great Dutch artist and printmaker Rembrandt Van Rijn (1606–1669). Like Rembrandt, Cotman created a sanctuary of his home and studio and filled them with art, fine objects and historical furniture. In Norwich in the 1820s and 1830s, Cotman lived in a grand house in an area of the city known as the Bishop’s Plain. Like Rembrandt, ill-fortune forced Cotman to sell it all at a pittance. 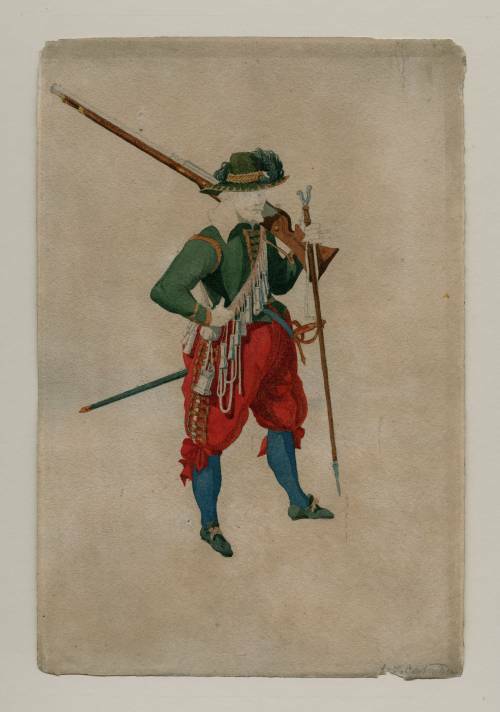 This watercolour is a coloured sketch for an engraving made in 1833. The model is presumed to be Cotman’s eldest son, Miles Edmund, who was 21 in 1831, and worked alongside his father in the Cotman studio. 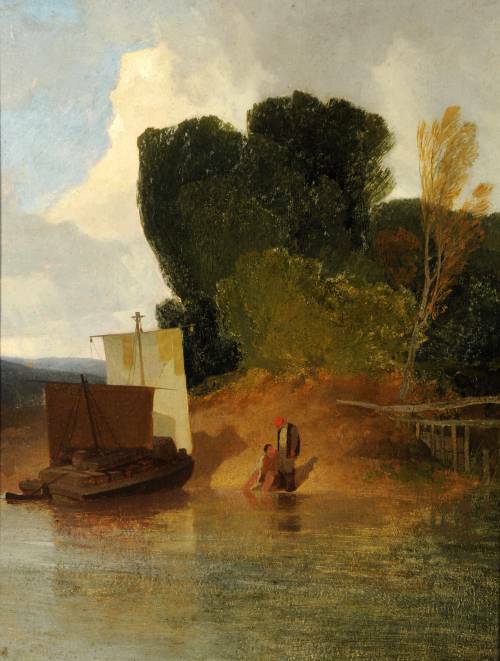 It is the key image of a series of works from the 1830s in which Cotman explores scholarly immersion in books and art and antiques – the haven that he tried to create in his Norwich home. 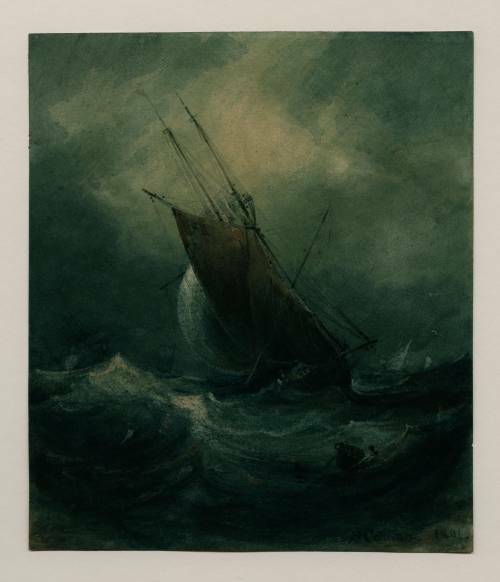 Stormy weather was a popular subject for artists in the early 19th century. These natural subjects were popular with an increasingly urban population, and perhaps embodied current anxieties about uncontrollable forces of change. 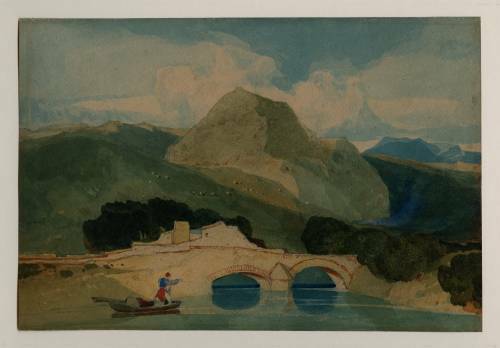 Cotman was only 19 when he completed this watercolour. 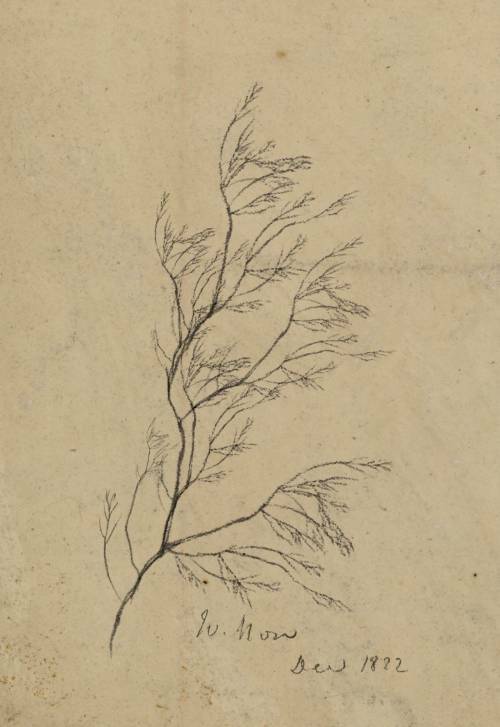 Kitson discovered this drawing glued beneath the watercolour A Schooner in a Fresh Gale and Choppy Seas, and subsequently found a further two drawings that had been concealed in the same way. 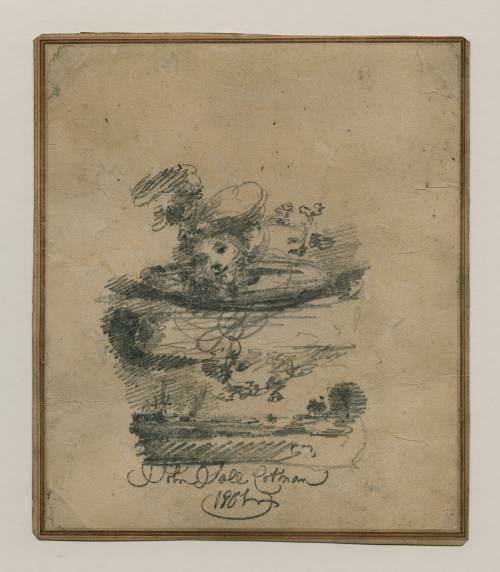 The drawing appears to be a self-portrait with Cotman’s face swirling among the clouds above a stormy sea. One of the major forces of change during Cotman’s lifetime was the Industrial Revolution. 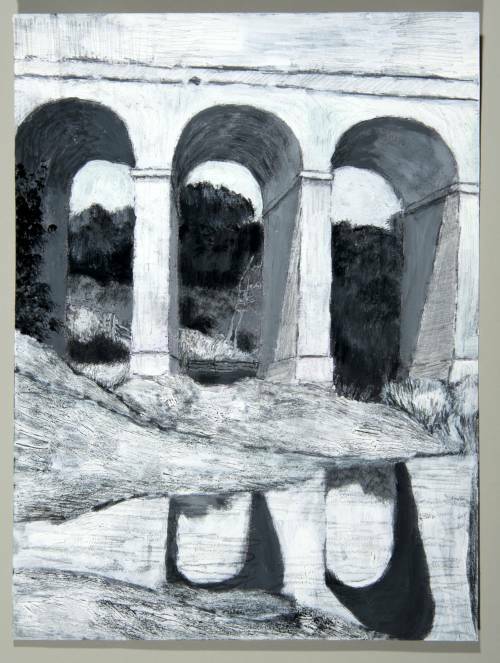 Coalbrookdale is popularly regarded as its birthplace, with its abundances of coal and iron smelting works. 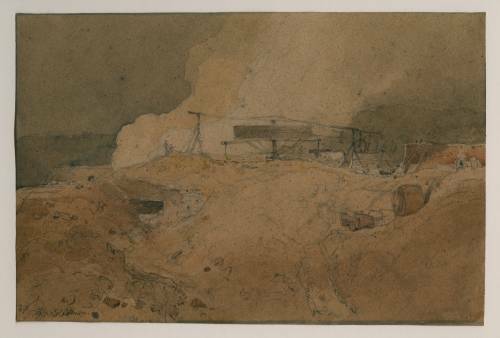 Here, Cotman depicts a hill-top mine, with a horse gin to power the winding gear. The Wrekin – a hill in east Shropshire – is visible in the background. Cotman visited Welton in September 1803 on a short tour of east Yorkshire. 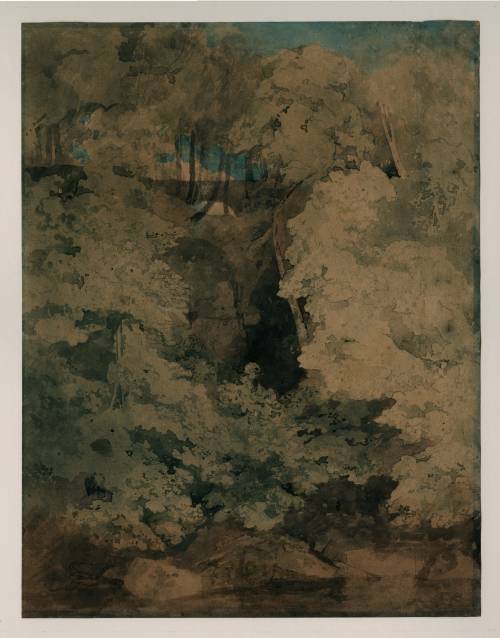 He finished at Wakefield, where Cotman made this watercolour for John Smyth of nearby Heath Hall. It is not known if Smyth had any connection with Welton. 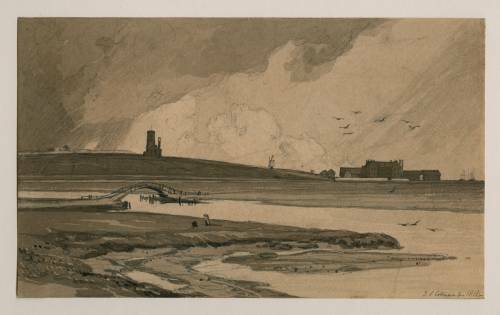 Although the windmill in this painting was demolished in 1843, the view across the Humber remains as spectacular as ever. 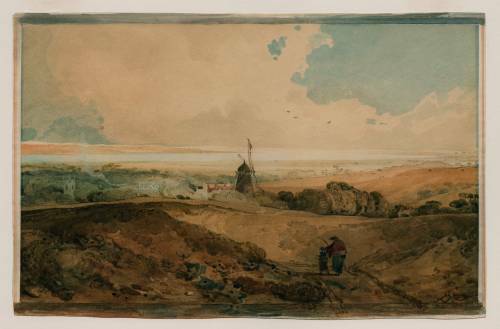 Windmills appear frequently in Cotman’s work. They are potent symbols of a pre-Industrial age. Ruins held a powerful place in the Romantic imagination. 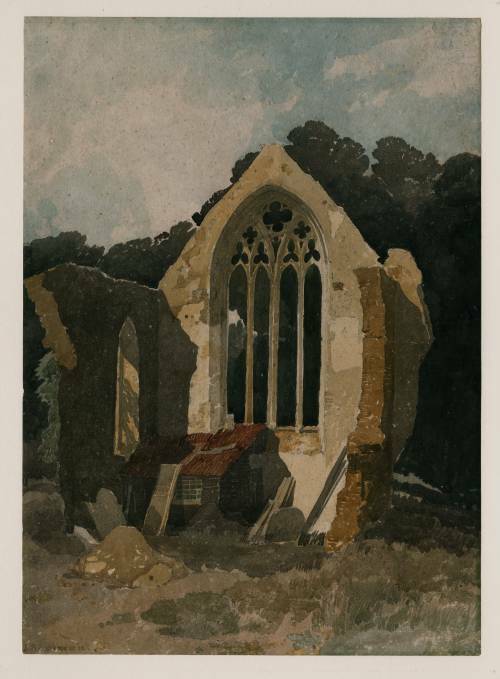 This small watercolour is Cotman’s earliest image of St Botolph’s Priory, which he visited for the first time in 1804. His treatment of the subject culminated in an etching, which was published in a series of Miscellaneous Etchings in 1811. 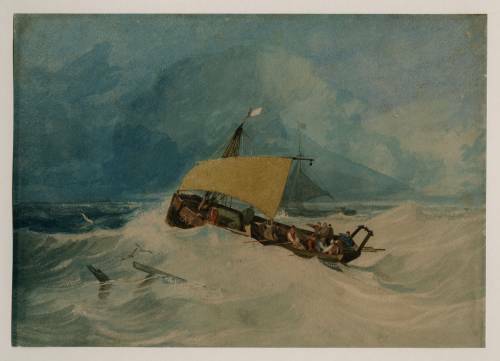 This series represented Cotman’s first attempts in the medium. Blakeney Church housed a light to guide ships into the local harbours. 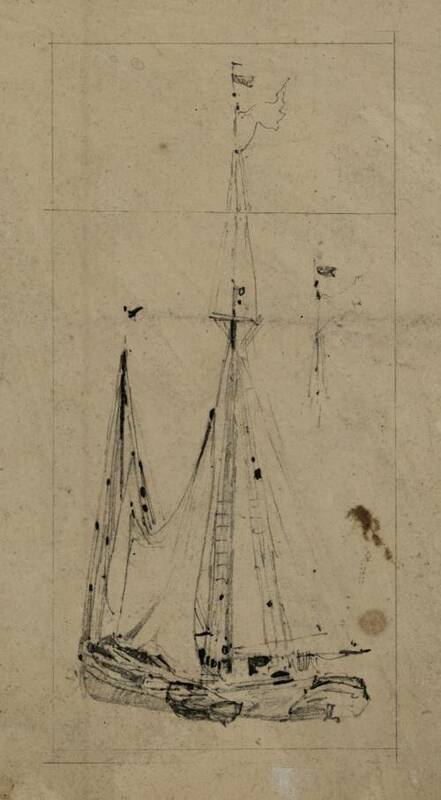 Cotman made this drawing to illustrate Thomas Cromwell’s publication Excursions through Norfolk, published in 1819. The series includes some of Cotman’s most austere work. 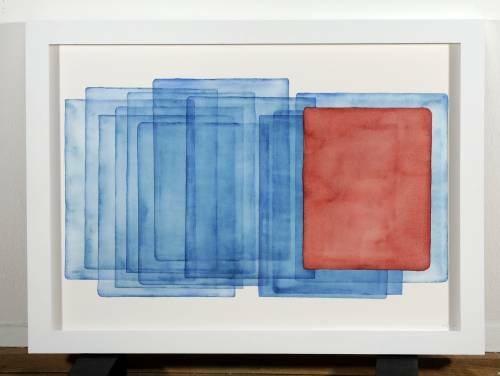 It is unclear whether the artist ever received payment for it from the publisher. This is a study of the spectacular phenomenon of parhelion, more commonly known as ‘sun dogs’, whereby two bright spots appear either side of the sun at an angle of 22 degrees. 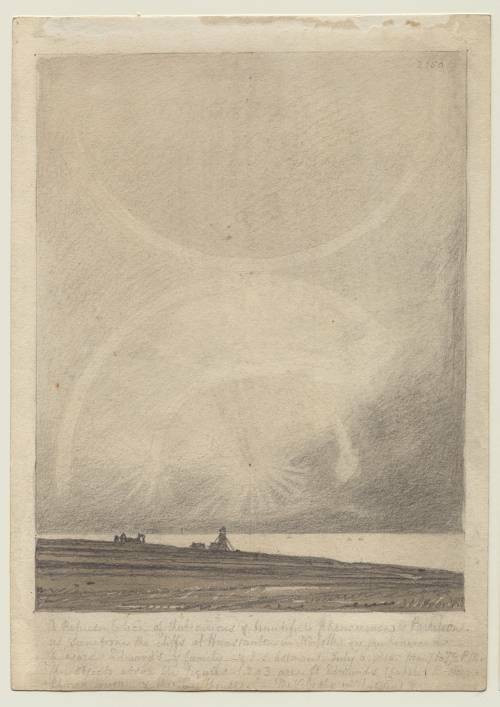 These particular sun dogs, witnessed by Cotman in 1816, may have been the result of atmospheric disturbance caused by the eruption of Mount Tambora in Indonesia in April 1815, which resulted in one of the most disturbed years on meteorological record. 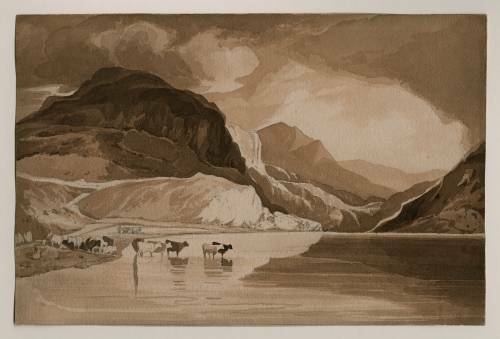 Cotman visited Llyn Ogwen during his tours of Wales in 1800 and 1802. 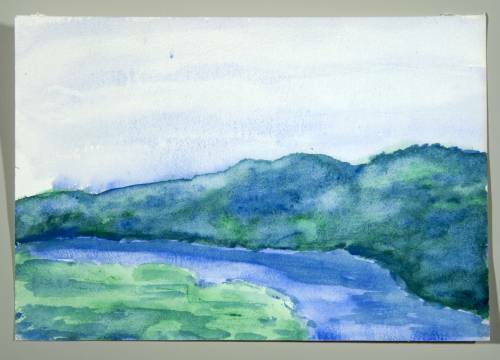 This watercolour records the view from the south shore of the lake Llyn Ogwen over to Elidir Fawr and Carnedd y Filiast. After his travels in Normandy, Cotman returned to sketches made at the beginning of his career. In the winter of 1823–24 he set up a new studio in Norwich with the intention of re-establishing his reputation as a poet of nature as well as of architecture. Cotman visited Domfront in southern Normandy in 1820. This drawing shows the view from the still-surviving ‘Cent Etages’ (100 floors) that descend from the castle barbican. The outcrop opposite is the Tertre Grisiere, and the hamlet that of Les Tanneries. The main boat here may be a lifeboat; the short masts would be very useful to navigate the heavy seas. This watercolour has been attributed to Miles Edmund, Cotman’s eldest son. 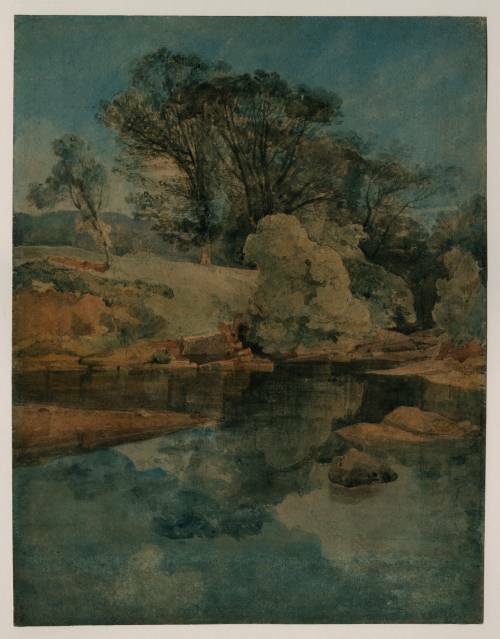 The quality of the figures and colour however suggest that it is by John Sell Cotman. In the autumn of 1841 Cotman visited Blickling Church in Norfolk. With a lifetime’s poetic store to draw upon he selected quiet subjects resonant with his personal associations. 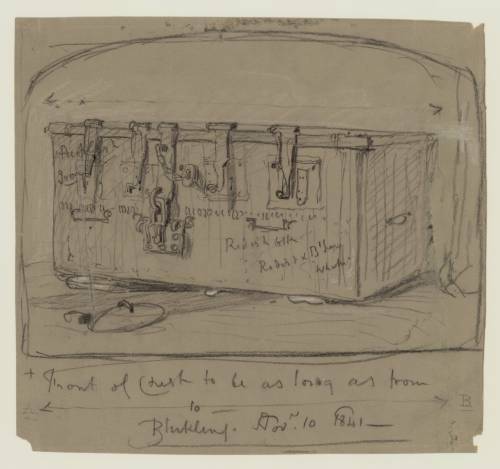 The subject of this drawing – a chest in a church in Blicking – speaks of old treasures put away; the equivalent of his own life’s store. Cotman died eight months later on 24 July 1842. 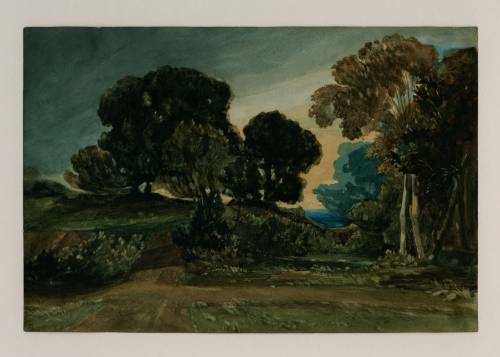 In the 1830s Cotman produced a series of small, highly coloured watercolours of landscapes. During this period, he often returned to subjects and scenes that he had depicted earlier in his career, but pared them back to the essentials. 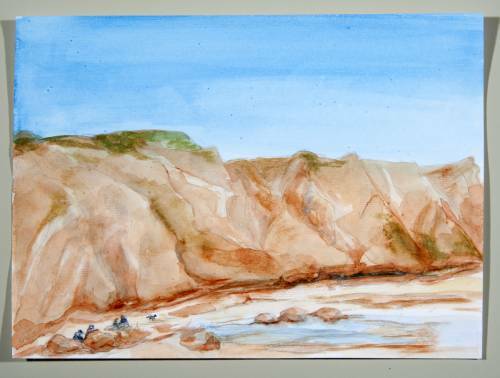 Cotman’s watercolours from this time have been described as ‘Harbours for the Soul’. 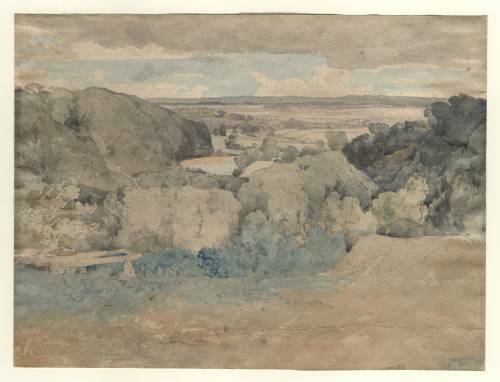 The scene depicted here might be Whitlingham, a small village south-east of Norwich. Cotman’s monochromes are among the most powerful works of his career. The scene in Road to the Hills might be based on the Hambleton Hills of North Yorkshire. In 1803 Cotman travelled in a gig with his Yorkshire patron Teresa Cholmeley to visit Whitestonecliff near Sutton Bank, a trip that resulted in his 1838 painting Scene of the Foot of the Hambleton Hills. This is another of Cotman’s ‘Harbours for the Soul’, drawing this time on memories of his visits to North Wales in 1800 and 1802. 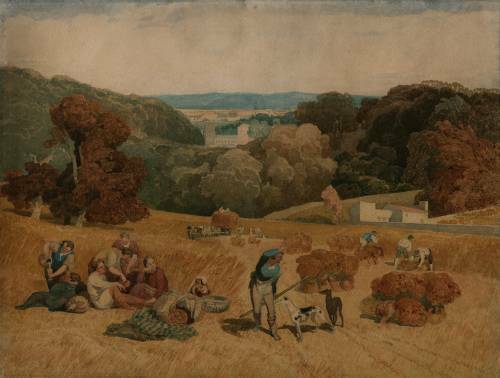 Cotman achieved his brilliance of colour and handling through mixing pigment with a unique flour paste medium. They were first shown at private gatherings of artists and patrons, which were attended by the leading watercolourists of the day. 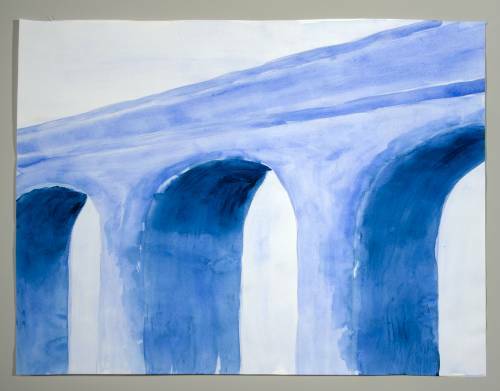 Many artists have found Cotman’s work inspiring. This was particularly true during the 1920s and 1930s when Cotman’s reputation stood at its highest. 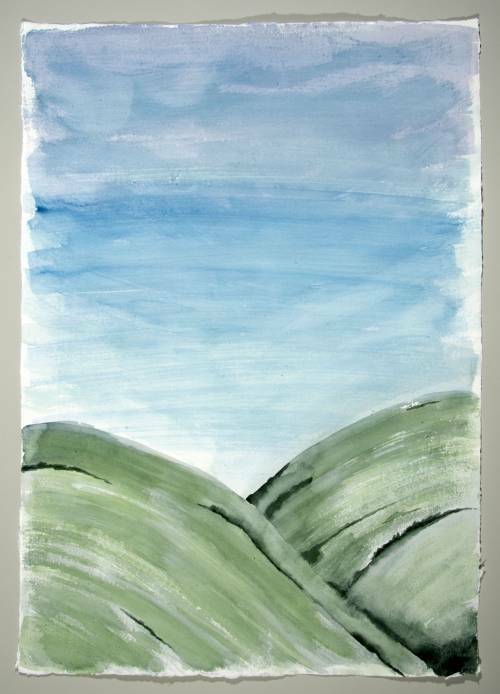 British artists including Eric Ravilious, John Piper and Paul Nash have all described him as an important forerunner to British Modernism. 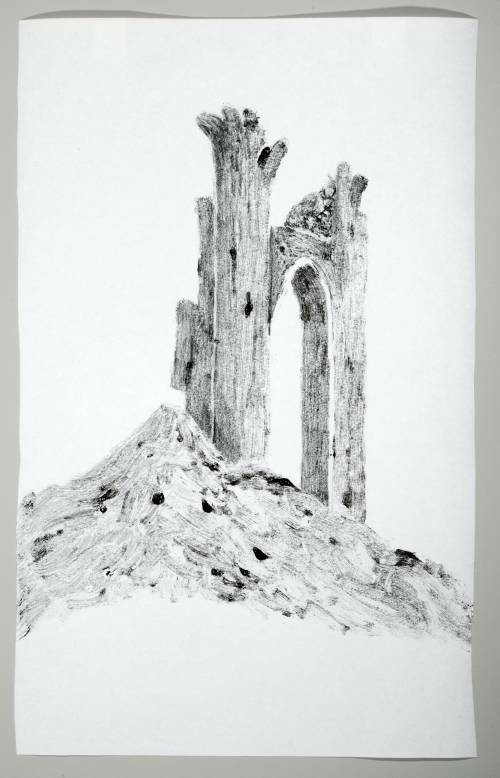 Artist-in-residence Hondartza Fraga has created a series of new works in response to the Cotman collection and Kitson archive. Fascinated by the relationship between the original objects and the tools used to care for them, Fraga has sought to reveal and make visible the hidden workings of both an archive and a collection. 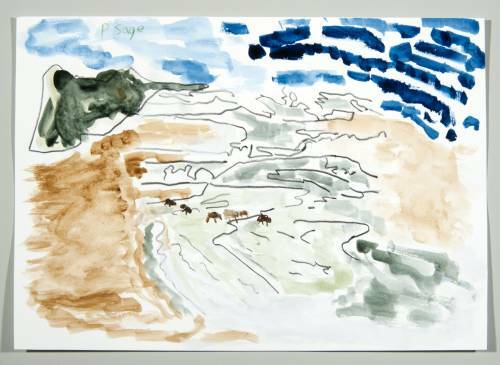 Her animations and watercolours exhibited here and in the previous room offer a contemporary response to the work of John Sell Cotman and a visual eulogy to Sydney Decimus Kitson’s ‘Cotmania’. 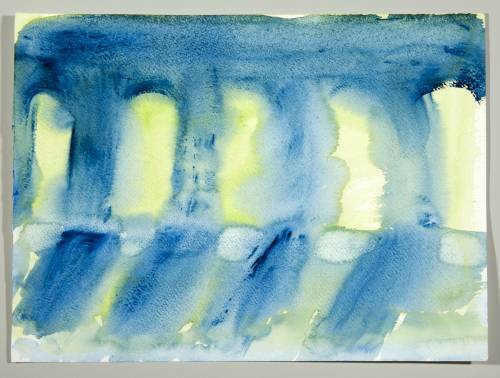 This work is based on the newly acquired Cotman watercolour Greta Woods that was regarded as one of Cotman’s most important works, following its inclusion in his 1922 exhibition at the Tate. The back of the frame is covered with labels that reveal a rich history of past exhibitions, owners and auction sales. 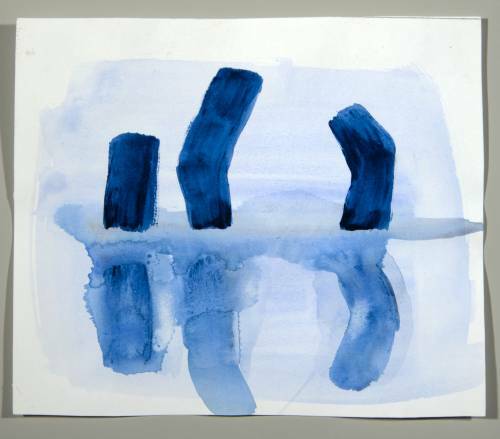 Fascinated by these labels, Fraga has used the forms and arrangement of these labels to inform this watercolour. 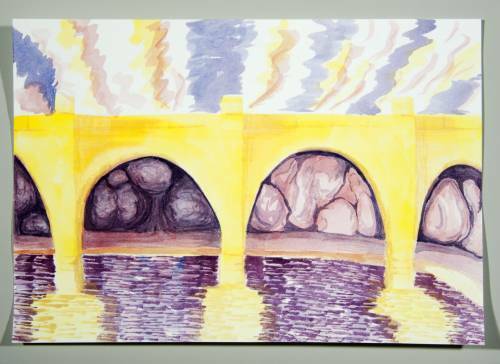 Artist-in-residence Hondartza Fraga has created these three watercolours in response to John Sell Cotman and his biographer Sydney Deciums Kitson. 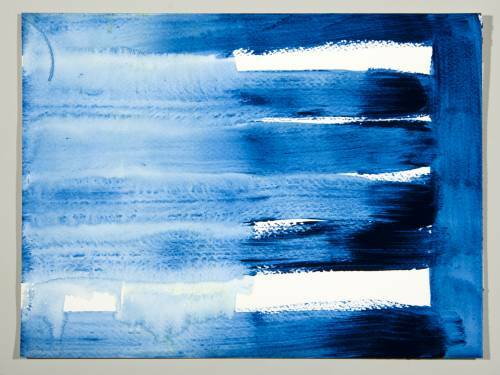 Fraga worked in watercolour after Cotman and chose blue after Kitson who bound his Cotmania notebooks in a greyish blue to echo Cotman’s use of the colour. 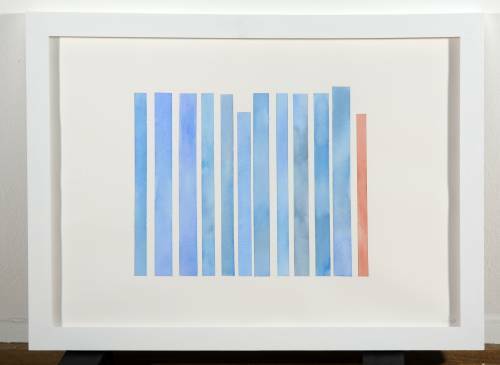 In her own words Fraga has sought to create ‘a visual eulogy to the archival process itself, its instruments and also its melancholy’. Kitson’s notebooks are particularly poignant. 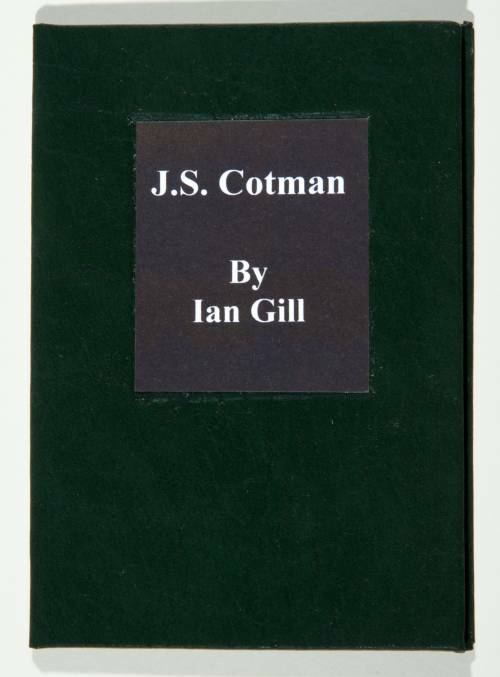 They trace his unfailing dedication to the study of Cotman. The last volume is incomplete, disrupted by his death, and remains bound in red. These three watercolours closely follow the form of Kitson’s notebooks, directing our gaze not to their contents but to their character. In Boat and Branch, Fraga has animated two of Cotman’s many sketches to harness and bring to life the freshness of the originals, and create a link between past and present. 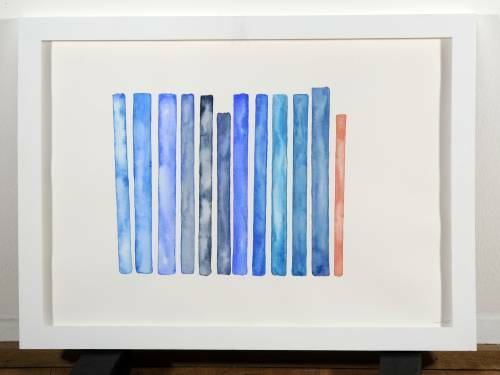 The watercolours, drawings, animations and book works displayed in and amongst the work of John Sell Cotman and Hondartza Fraga form an intervention made and curated by the community arts group Studio 3, Artlink West Yorkshire. 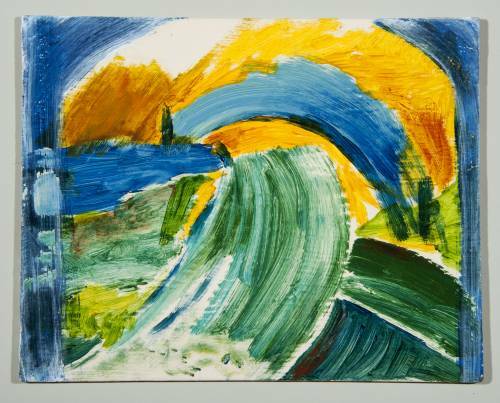 We invited Studio 3 to respond to the works of Cotman. 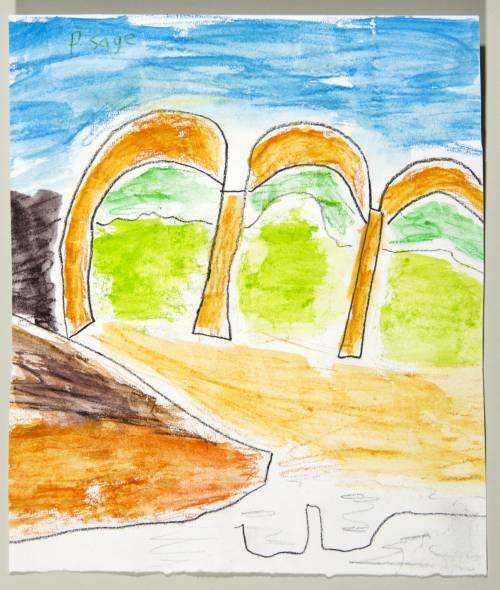 With special access to the collection and support from Artlink artists Jill Johnson and Rozi Fuller, the group have explored new ways of working with watercolour including painting in the outdoors at Knaresborough, following in the footsteps of Cotman himself. 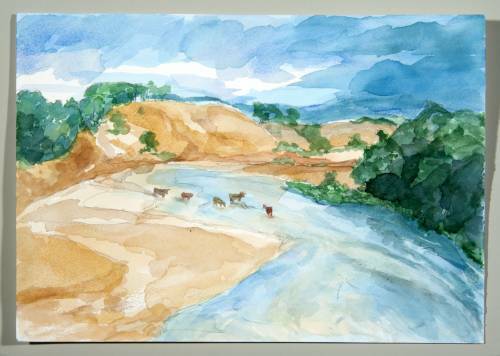 The enthusiasm for Cotman has generated a large body of work by Studio 3 artists. This intervention is a small sample of these works. 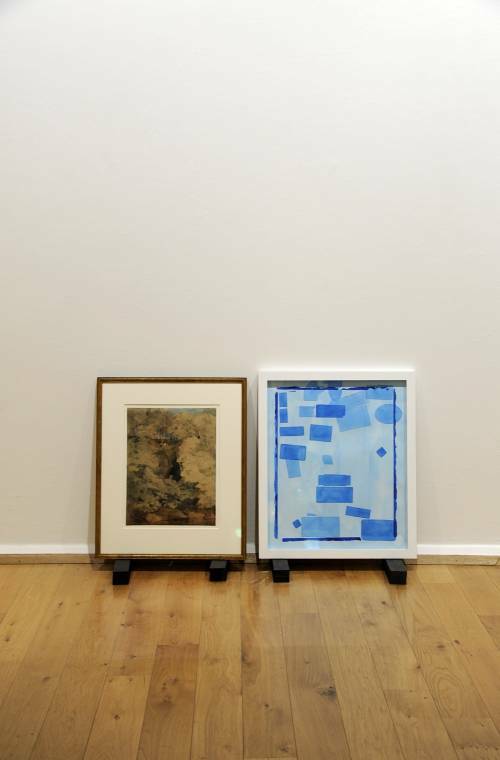 More can be seen by scanning the QR Codes in the exhibition and you can meet the Studio 3 artists in our Meet & Make event on the 10 November, from 1:30 to 4pm. 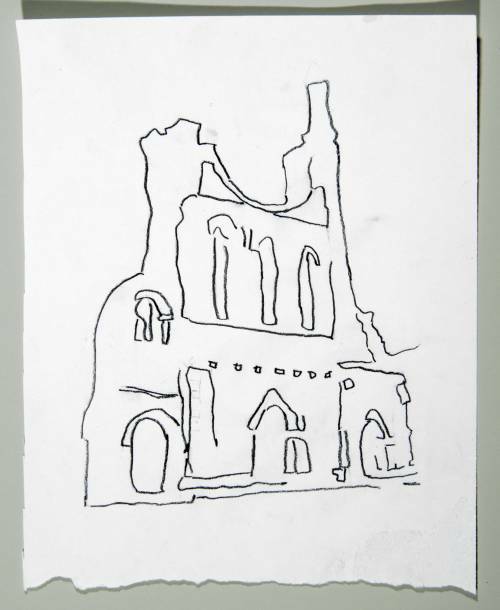 A site favoured by Cotman and an attempt (by this artist) to reduce detail by reproducing a series of increasingly simplified images from memory. I had two approaches to the Cotman project. 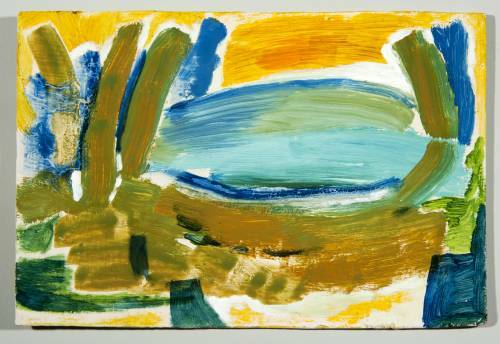 The first was to use the medium he is most associated with, to produce images of my own. 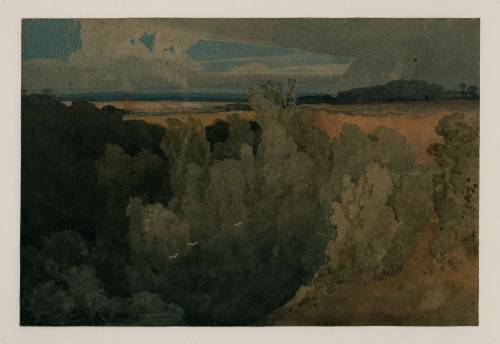 The second was to take the watercolour images produced by Cotman and roughly translate his subjects using different media. I'd rarely used watercolour before this project, but doing the sketchbook work, I realised I could experiment with layering and blending effects. 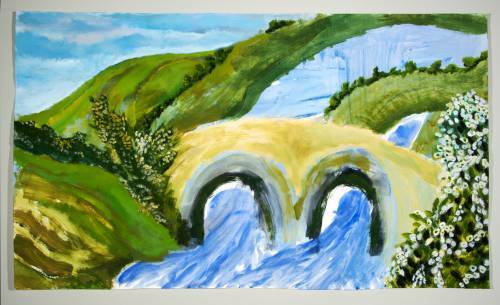 I also discovered how watercolour can work on a large scale, and how dynamic and subtle the effects can be. 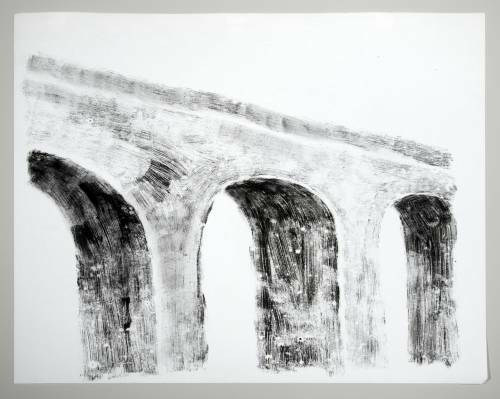 I stuck to a limited colour range for each piece, so as to emphasise the different mark-making techniques, which carried in to the second approach. 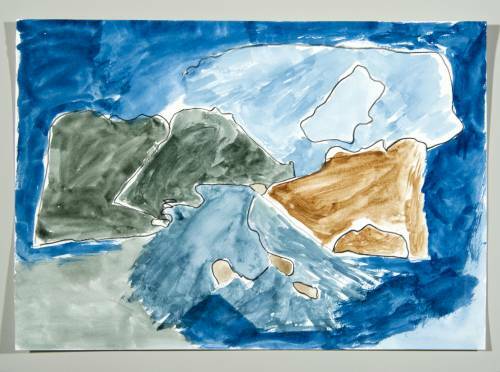 This invloved multi-media; oil-based monoprints, ink, pencil and wash, acrylic, and digital work, inspired by Cotman's subject matter. It was great to try such a range of media. 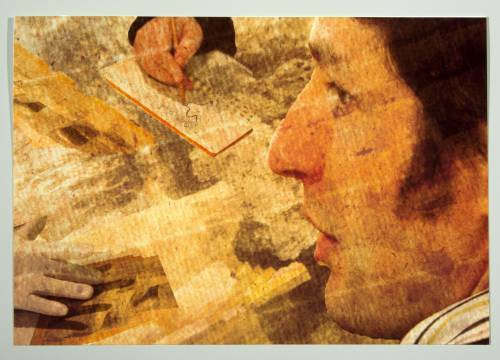 A montage of images relating to JS Cotman using photos of his work and an image of one of the curators. 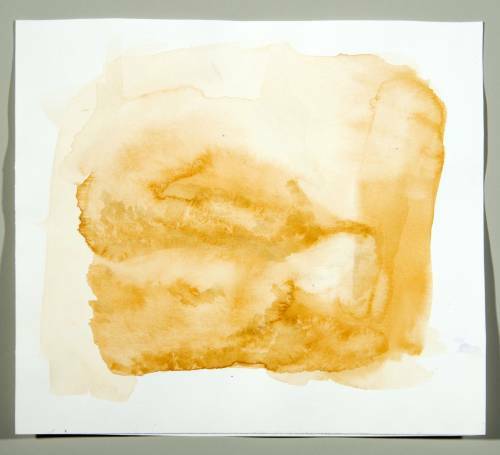 This image relates to one of Cotman's paintings which you had to look hard at to see what was in the painting. My work is digital photography and this piece used many layers. This is my preferred method of working. The book was handmade and took 24 hours to complete. 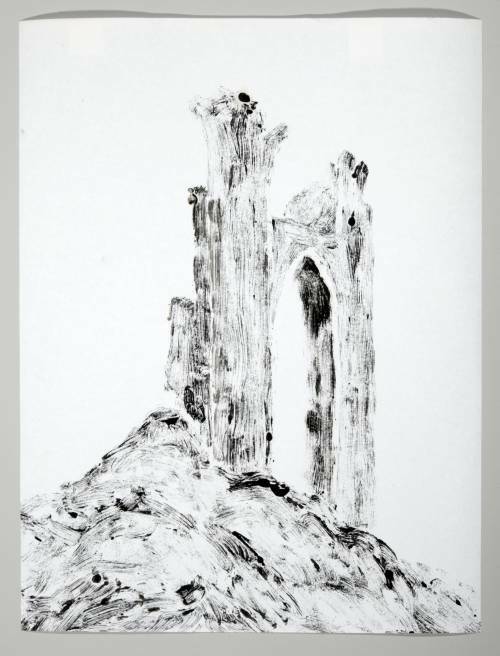 It includes poetry, text and photography in response to JS Cotman's work. 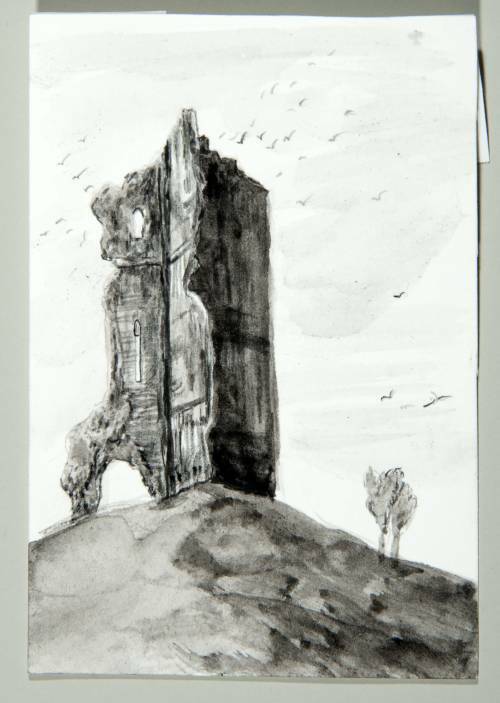 Two sketches from a photograph of the West Front of Byland Abbey by David Hill, relating to Cotman's painting of 1804. 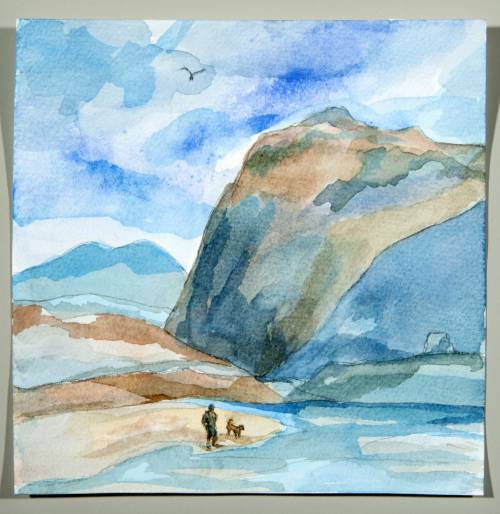 I felt my watercolour washes were improving at this stage and was keen to include a dog. A painting from a contemporary of Cotman, John Varley, 'View in the Pass of Llanberis, Wales', 1803. 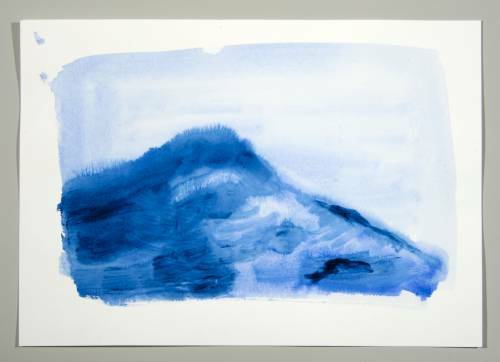 I tried some more expensive watercolours bought for the project, struggled to imitate the curves in his composition. I thought this would be a good subject to practice washes. Grey scale images directly taken from Cotman. 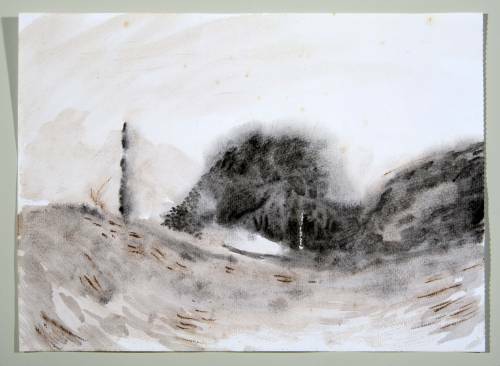 A grey wash image directly inspired by a Cotman painting. This was the start of the most experimental stage, wet-on-wet. Direct copy but in monotone. 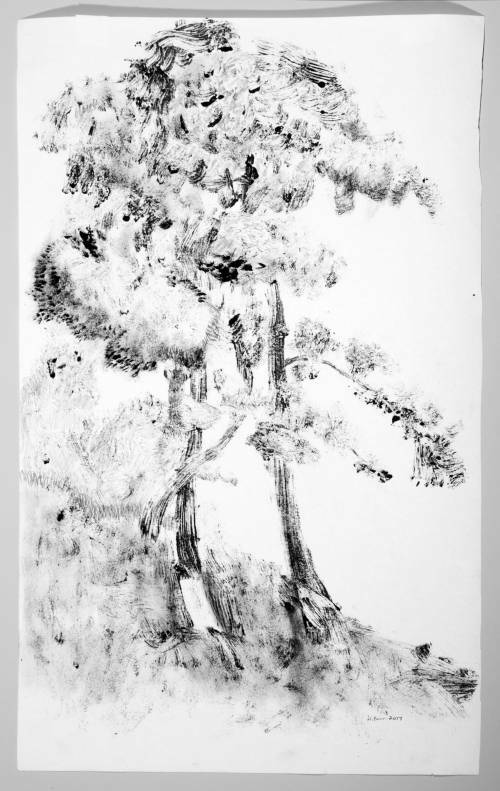 A monoprint interpretation of a Cotman. 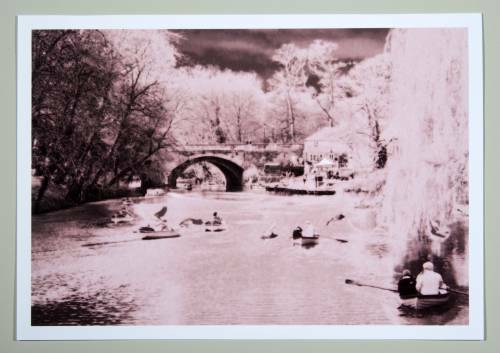 A part-imagined composite image of Knaresborough.